NASA's black-hole-hunting NuSTAR X-ray space telescope has found 40 new black holes and neutron star binaries in the Andromeda galaxy. The inset at top shows the X-ray view of a section (see main image) of Andromeda. A NASA observatory has zoomed in on the Andromeda galaxy with X-ray vision, revealing 40 black holes and neutron stars gobbling down gas from a stellar companion and releasing torrents of X-rays. Scientists used NASA's Nuclear Spectroscopic Telescope Array, or NuSTAR, to make the new discoveries in Andromeda — a nearby spiral galaxy, like Earth's own Milky Way galaxy, located 2.5 million light-years away. Still, Andromeda's relatively close proximity to the Milky Way helps, researchers said. 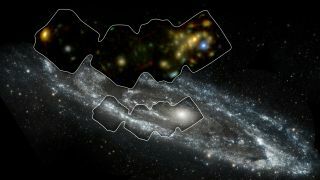 "Andromeda is the only large spiral galaxy where we can see individual X-ray binaries and study them in detail in an environment like our own," Daniel Wik, of NASA's Goddard Space Flight Center in Greenbelt, Maryland, said in a statement. "We can then use this information to deduce what's going on in more-distant galaxies, which are harder to see." With NuSTAR's new data (which were presented at the 227th meeting of the American Astronomical Society in Kissimmee, Florida, this week), Wik and his colleagues are attempting to identify the fraction of X-ray binaries that harbor black holes versus neutron stars. Andromeda's population can then stand as an observational proxy for the populations within more-distant — and therefore earlier — galaxies. "We have come to realize in the past few years that it is likely [that] the lower-mass remnants of normal stellar evolution, the black holes and neutron stars, may play a crucial role in heating of the intergalactic gas at very early times in the universe, around the cosmic dawn," Ann Hornschemeier, also from NASA Goddard and principal investigator of the NuSTAR Andromeda studies, said in the same statement. "Observations of local populations of stellar-mass-sized black holes and neutron stars with NuSTAR allow us to figure out just how much power is coming out from these systems," she added.